The Quinta do Sopé built with two houses and an orchard with 2000 m2, located in a upper area of the vineyard traditional culture known as "currais" built with basalt stone. The orchard of biological production has fruit during the whole year and it can be picked and savoured by the visitors. The orchard has citrines, pineapple, annona, chestnut trees, medlar-tree, grapevines, figs, guava, and passion fruit. External balcony with ocean and vineyard view. Ocean view and the traditional culture of the vineyard called "currais". Chestnest tree in the orchard. Forestal reserve of recreation of S. João to 2,5 km of the house. Rooms with traditional furniture. The visitors have the privacy and home comfort. - living room and stairway with access to the 2nd floor. - yard with table and barbeque. 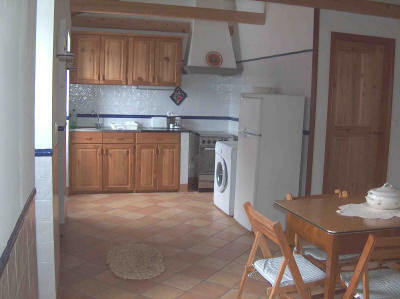 Kitchen and dining room (2nd floor). Bedroom with double bed (2nd floor). Bedroom with double bed (1nd floor). Bedroom with two single beds (2nd floor). Living room and stairway with access to the 2nd floor.